The following is pictoral and descriptive overview of the restoration process that a classic soda vending machine recieves while at The Pop Machine Shop. 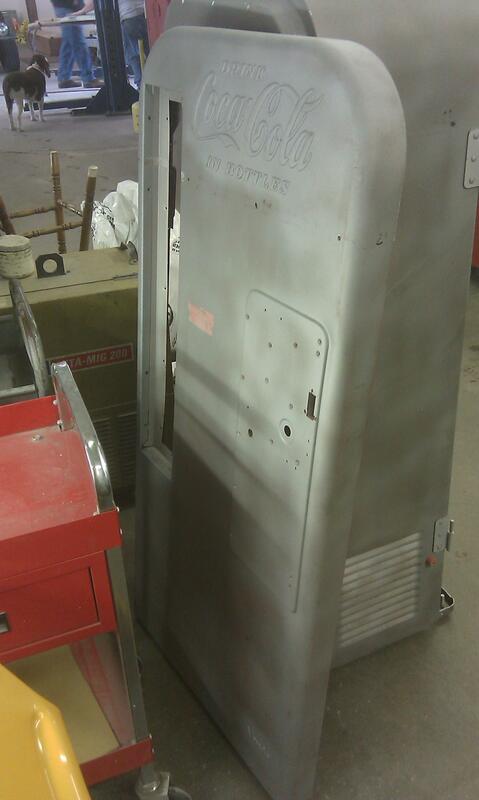 Please note these photos represent a restoration of a VMC or VENDO 81 Soda machine, but the process is very much the same or simliar on any of the vintage machines I restore. 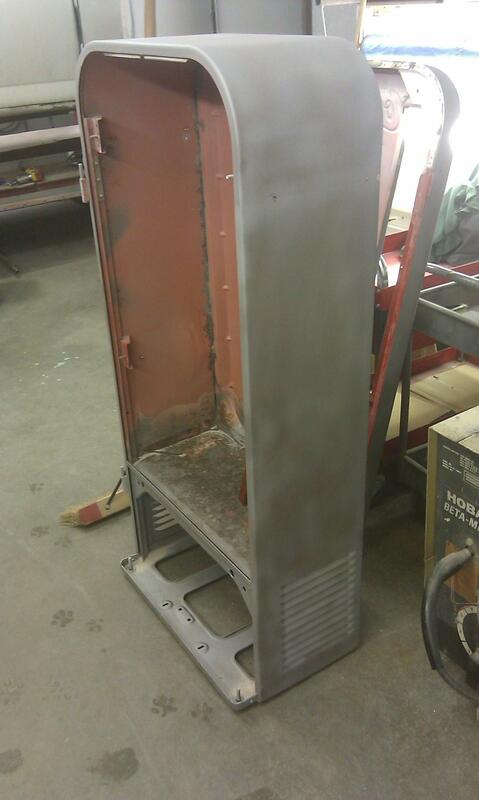 The cabinet, main door, coin door,bottle door,backing plate and hinge are then all media blasted to remove all paint, rust, and anything clinging to the surface to give us nice clean bare metal to start to work with. 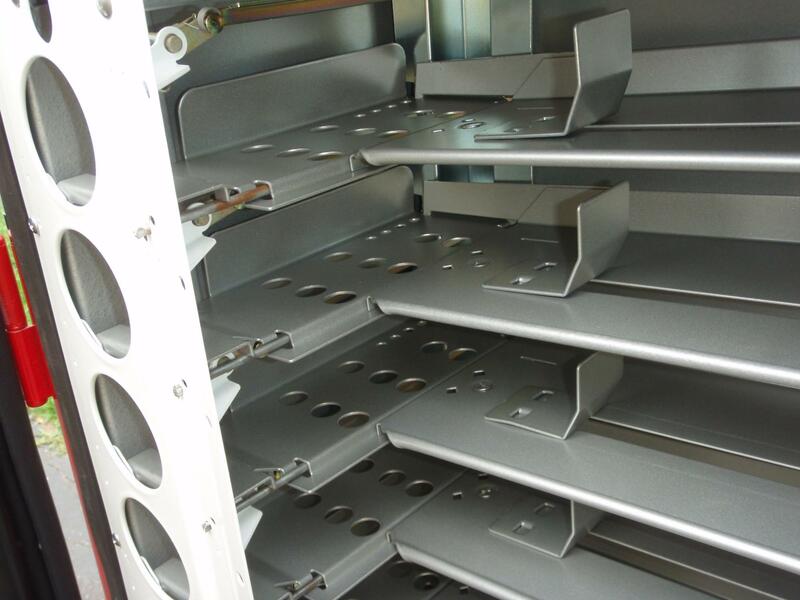 Typically the bottom pan of the main cabinet is rusted through so that pan is removed and a new pan is installed and welded in place. Once the cabinet and other parts are blasted clean the body work process begins with pounding out dents, filling in holes, and getting the body nice and straight and smooth. Any rusted out areas would be cut out and new metal is welded back in and smoothed. Often times the bottom pan in the cabinet is rusted through, so that is cut out and a new pan is welded in place. Once all dents and issues are corrected body is skim coated and sanded smooth and is ready for a primer base coat which is applied , then sanded again and this process is repeated until the body is perfect and ready for paint. Once cabinet,door and small parts are prepped for paint, off to the paint booth they go for 4 coats of automotive grade enamel paint. The paint codes for my machines are computer color matched to original paint off of original machines, or if we don't have the code, often we can scan a part of the origianl machine to recreate the origial color. 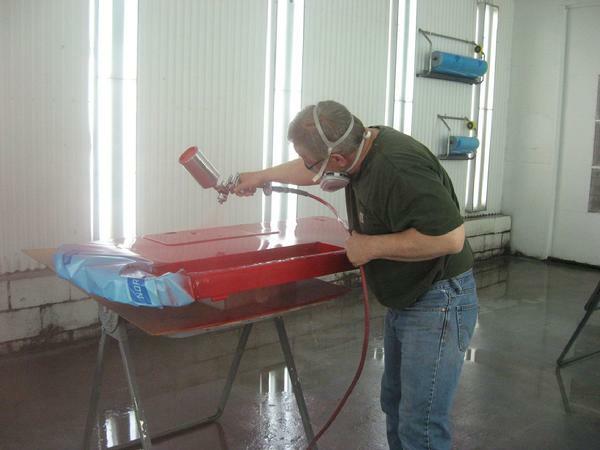 Paint is applied professionally and allowed to cure before it is handled and move to the next step in the process. The Main Cabinet Door Next gets stripped down. First all the screws come out that hold on the door liner and Gasket, Plastic Door liner is removed and discarded as they are not salvagable. the old insulation is removed and then the Bottle door gasket and light assembly is unfastened from the machine and removed for rewiring. finally the Stainless Steel Bands are removed from Door and unt is ready for sandblasting with cabinet. The machine is brought into the shop where the dissasembly process begins. 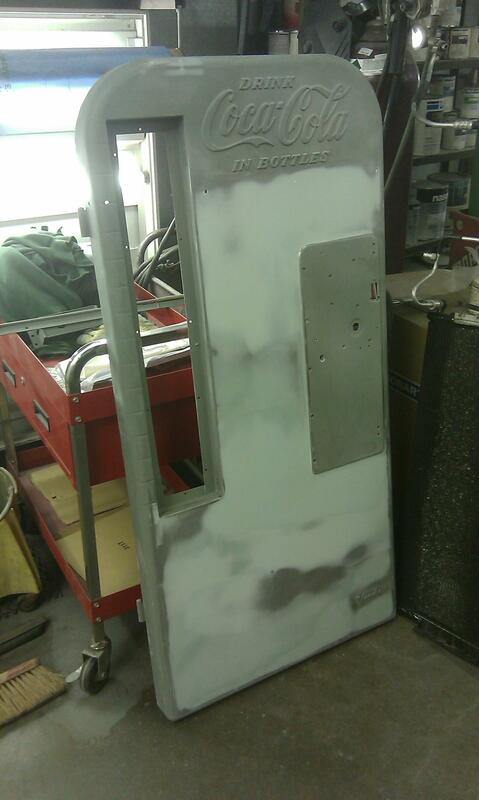 Coin Door and Bottle Doors are removed, Coin mechanism is removed and all door hardware is removed from main door. Main door is lifted off it's hinges and set aside. Bottle shelves and supports are removed, Bottle stack is removed from main cabinet for later disassembly. Breaker strips are removed and discarded as new ones will be used. Compressor unit is unscrewed and unbolted from cabinet and whole assembly is carefully removed and set aside. Inside Tub is removed from main cabinet. 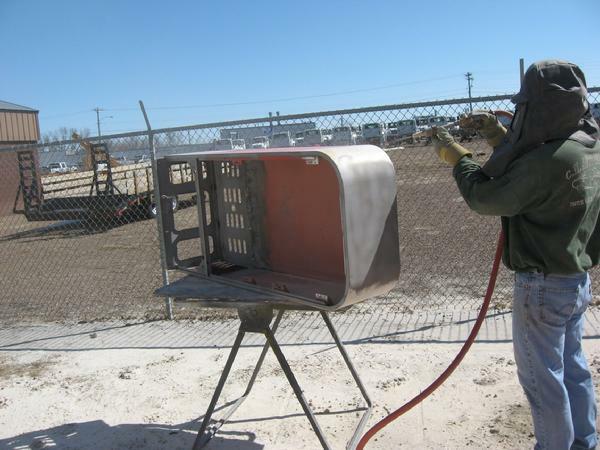 All old insulation is removed and discarded as new insulation will be used later.Stainless Steel strips if present are removed and cabinet is now ready for Sandblasting. Now that all the external parts are taken care of we'll take a look at what goes on with everything on the insides. While the cabinet was in the shop for paint, The bottle stack was taken apart and sorted for plating, the small parts like bottle gates and rods are sent out for zinc plating, the face plate and other remainng parts are sent in for powdercoating along with the tub and shelves. The cooling unit was removed during dissassembly and now it's ready for restoration. It gets stripped of all old wiring, fans, and shroud. The unit gets tested for leaks or problems, if problems are detected, system is fixed by refrigeration technician. Once system is good to go, it gets sandblasted clean lower deck, compressor and evaporater gets repainted, condensor unit gets cleaned, polished or painted. New fans are installed and new wiring harness, new power cord are installed. New fan shroud is installed and new thermostat is installed. Insulation is installed on cooling lines to ensure best operation and unit is then installed back in finished cabinet when completed. Since this is a coin operated machine, I feel that the coin mechanism should recieved just as much attention as the rest of the machine, hence the coin mechs get a complete restoration as well. Once they are removed frrom the machine, they are checked over for completeness to make sure all working parts are there. Generally they are not working due to dirt, grime and 50 years of use. The coin mech gets taken apart, peice by peice , screw by screw and each part catalogued. The individual parts are cleaned and then sent off for zinc plating. Any parts that can not be zinced due to the kind of metal they are made from are cleaned and polished. Once all parts are back from zinc the rebuilding stage begins and each mech is meticulously put back together, with new screws, hardware, springs and tested to ensure proper installation. Decals are reapplied like they where when it was new and the coin mech is ready to accept coins once again. The other important part of the machine is the bottle stack or vending mechanism on the particular machine where restoring. 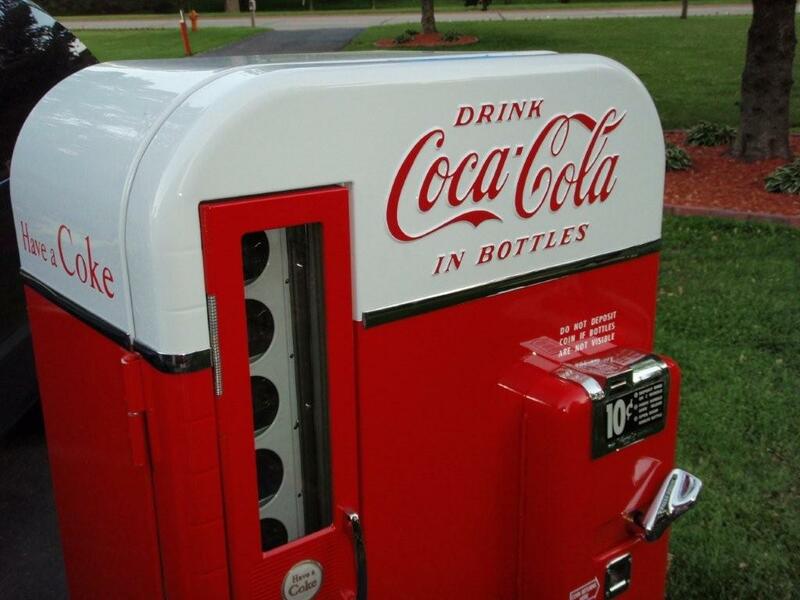 For illustration purposes, i'll talking about a bottle stack out of a Vendo 81 ,56 or 110 vending machine. The bottle stack is dissassemlbed and the bottle gates and support rods are zinc coated. the backing spine, bottle shoes are powder coated, and the ratchet assembly that makes it all work is taken apart and cleaned, polished ,Typically this part is Stainless steel, so it gets cleaned and polished and all the internal parts of it are cleaned and lubricated and installed. 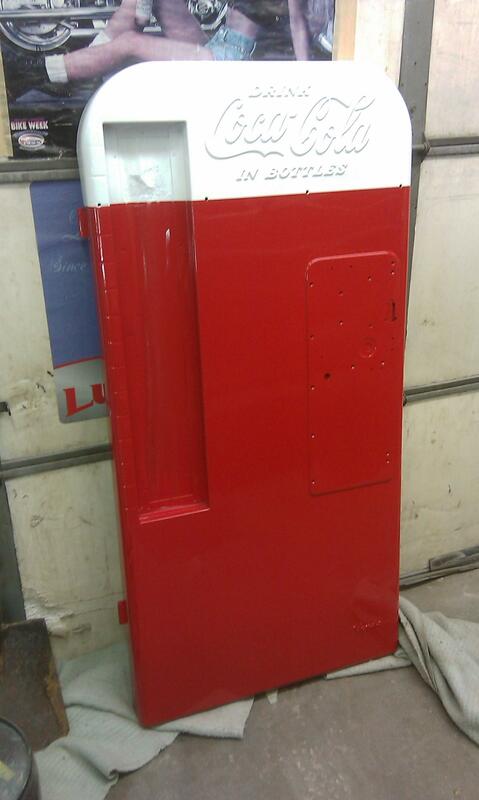 The faceplate is powdercoated to endure the use of bottles being pulled through it. 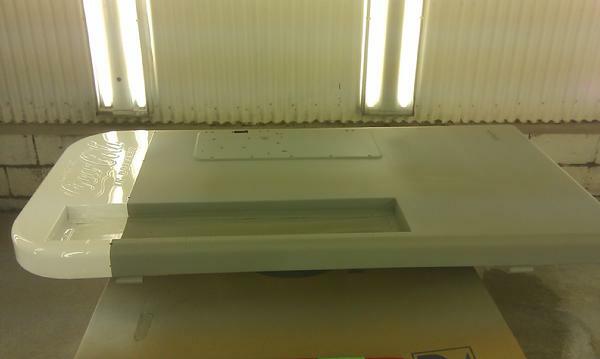 Once all parts are done, they are then reassembled and installed back in machine. It's now time for reassembly. The main cabinet gets new insulation before the newly powdercoated tub gets installed. Once the tub is installed, the bottle stack and compressor can now be reinstalled. The Main Door also gets new insulation as well as the rewired light bar gets reinstalled with new bulb. Once the Tub and new insulation are installed, New Breaker strips are installed to hide the space between the tub and the main cabinet. the bottom breaker is held in with Stainless Steel Screws and the sides are held in by spring style clips. Once this step is done the cabeint is ready to recieve the bottle Stack, shelves and finally the compresor and evaporator unit. The Main door is the focal point of the restored machine. 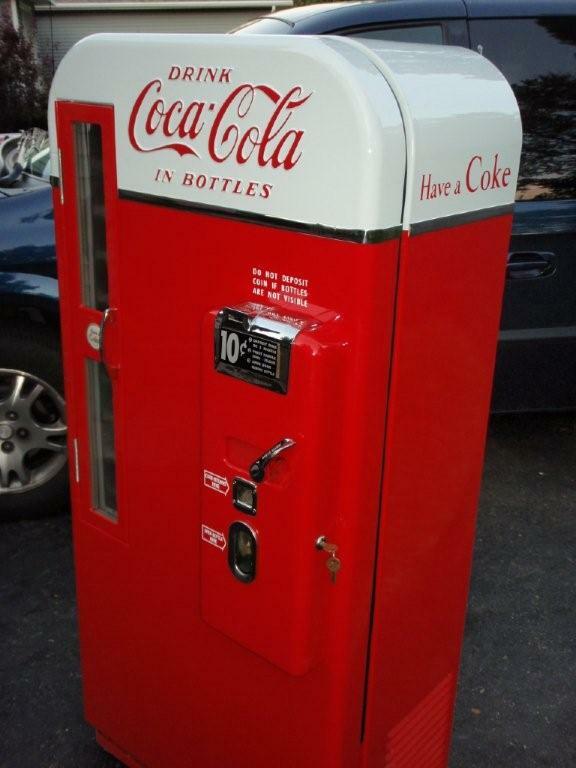 The freshly painted door is brought to the sign painters where my professional artist Hand Letters the Coca-Cola Embossing that is on the top part of the machine, the lower "VENDO" logo is also hand painted. The main door now goes through it's restoration process. While the door was in paint, the light bar was removed and dissasembled and rewired with new electrical, switches and flourescent light . The stainless is polished and then the whole assembly is reinstalled back into machine with all new rubber bottle door gasket as well. The stainless steel banding that seperates the white top from the red (if originally equipped) are restored to new condition, but knocking out all little dents, dings and bends and then highly polished to a mirror like shine. These are then reinstalled and tighted down . All new insulation is cut and installed into the machine to ensure proper cooling. Finally a new door liner is installed with new rubber gasket to give it a nice tight seal. All new Staineless Steel hardware is used as well as new instruction decals and replated hole covers. 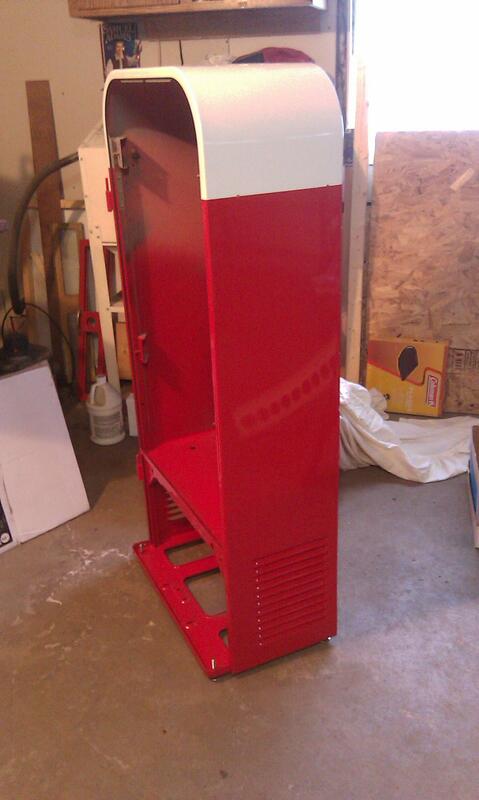 Once the door is hung, the Coin mech is installed, the coin door, and all additional hardware is installed and connected. Bottle Door is reassembled with all new glass and plexiglass inserts as well as new foam gasket. 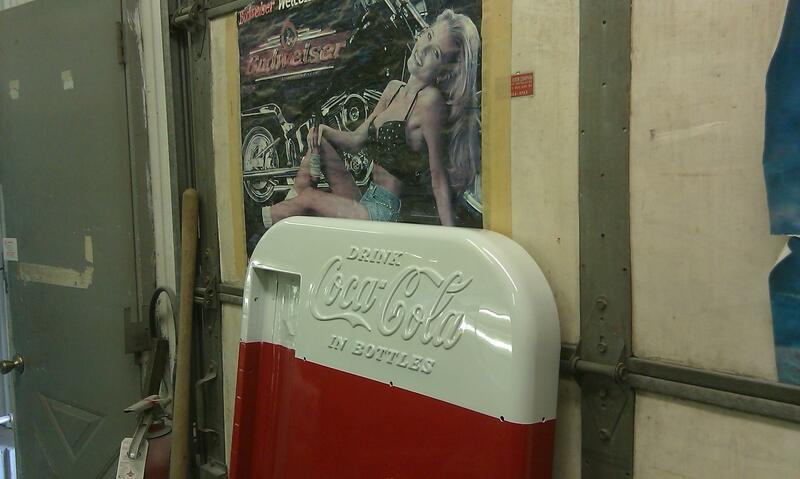 Original Have a Coke Emblem is reused if in good original condition, or reproduction inserts are available if original is not usuable. 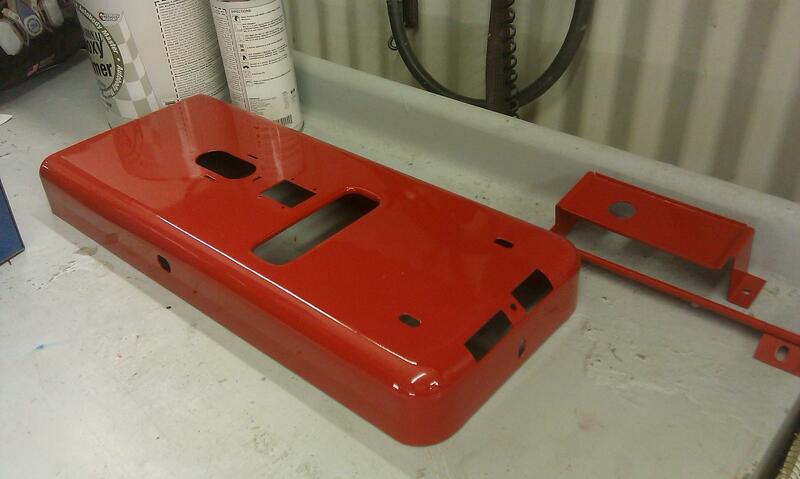 Door hinges are painted, cleaned and polished as well as new Chrome handle. Door is then hung into position, and adjusted for nice tight fit. Basically the machine is nearly done. Just final adjustments, cooling unit is run for 3-5 days in the shop. Coin mech is tested for proper operation, as well as vend stack. Final decals and such are applied where applicable and machine is then cleaned top to bottom of dust, fingerprints, etc. The machine is then prepped and packaged for shipping or pickup.